The Wine Bloggers Conference had a full agenda. We focused on preparing for the actual conference sessions. We knew exactly what sessions we would attend. However, we realized on Thursday that we had not paid enough attention to the details about the Friday Night excursions. Thankfully, we were tipped off about that and looked at it in more detail. The Friday evening excursions are a Wine Bloggers Conference tradition. The Lodi excursions were unique though. The excursion groups were smaller than past excursion and they were top secret! The only thing we knew was the name of our excursion, Dutch Crush. You see, you “signed up” by selecting a ribbon with an excursion name. Some of the names were “Gone with the Wine”, “She’s a Brix House”, “99 Bottles of Wine”, just to name a few. We had no idea what winery was associated with each. All we knew is that we would be whisked away to a winery for an evening of wine and food. We all gathered by our sign – Dutch Crush! The conference sessions ended at 4pm on Friday. We were told to head outside and find our group. 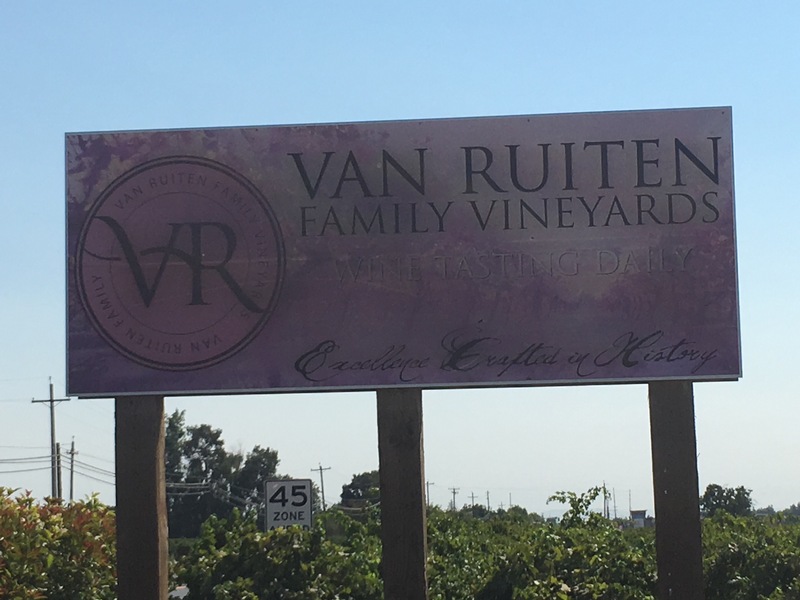 It was there that we learned from Billy, our chauffeur, that we were headed to Van Ruiten Family Winery (https://www.vrwinery.com), his family’s winery. We piled in the van (Mercedes Benz no less) and headed over to the winery. We were greeted by Billy’s mom and dad, Bill and Angie along with Angie’s brothers, John & Jim, John (Winemaker), Bill (President) Rustin (Sales Manager), Akaylia (Tasting Room), and Elyse (Tasting Room). I’m sure we’ve missed someone though. We do apologize. The patio was set up for appetizers and a refreshing glass of 2015 Pinot Grigio. It was hot, and we were thirsty. The Pinot Grigio hit the spot! Appetizers were ready when we arrived! We all grabbed a glass and headed out on our tour led by John the winemaker. We visited the barrel room, the lab, the crush pad and stopped by the big tanks which were filled with recently pressed pinot grigio from the 2016 harvest. The yeast was about to be pumped in the tank. It was cool to see the yeast. It looked like bread dough. We ended out tour with a look at the bottling line. Following the tour of the winery, we loaded back up in the van. We were headed to the vineyard. Chardonnay was being harvested. We were going to get to ride a harvester! How cool is that? Turns out it’s not that cool, but that’s only because it was still blazing hot out. It was also dusty, but the experience itself was amazing. We don’t see many machine harvesters in North Carolina. We may not have the chance again. One of the best things was being able to see the vineyard from on high. It made the expanse of the vineyards in the Lodi area really hit home. Acre upon acre upon acre of vines is not something we see in North Carolina either. We’re certainly grateful to have had this experience! The view from atop the harvester! We climbed back in the van to return to the winery for dinner. We were greeted with a glass of the 2015 Reserve Double Barrel Chardonnay. It was perfect timing! We were thirsty again. This Chardonnay certainly hit the spot! We soon took our seats at the table. Each table had at least one Van Ruiten family member (We also met Bill and Angie’s daughter, Mia) and at least one winery staff person. It was a great way to get to know the team. We were fortunate to have a seat at Bill and Angie’s table along with Bill (President) and Christine of girlsgogrape.com! It was a fun table! We especially loved hearing all the stories from Angie about her mom and dad, John Sr. and Ann. You could see the love on her face as she was telling the stories. You got a sense of what a remarkable couple they were. It was very moving. In addition to the great conversion, we got to experience a variety of the Van Ruiten wines. Some of the standouts were the 2013 Cabernet Sauvignon and the 2013 Cab-Shiraz Blend. Of course, there was also great food to go along with those wines. Each course paired perfectly with the selected wines. The highlight for us was the homemade Dutch cookies (made by Angie) that were paired with the Late Harvest Viognier. Van Ruiten Family Pictures hang in their tasting room. After dessert, more wines and conversation were shared. Hugs and thank yous followed. We left feeling part of the Van Ruiten family and grateful that we’d been lucky enough to share the evening with them! If you’re ever in Lodi, please go visit them! We know we’ll be back!